For intense training or competition you should refuel during exercise with up to 90g carbohydrates per hour depending on the intensity and duration. POWERGEL® SHOTS deliver the same function as PowerGels with a scientifically developed combination of different carbohydrate sources. 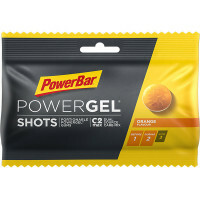 They are designed for before and during sport and easy to portion! Sugar, glucose syrup, invert sugar syrup, water, gelatine, acid (citric acid), humectant (glycerol), natural flavouring, acidity regulator (sodium citrate), caffeine, stabilisers (carrageenan, locust bean gum), barley malt extract, vegetable fat (coconut, palm kernel), glazing agent (carnauba wax), black carrot juice concentrate, liquorice extract. During sport we recommend to consume up to 90g carbohydrates per hour depending on the intensity and duration. 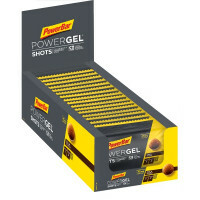 1 POWERGEL Shot delivers about 5g carbohydrates. 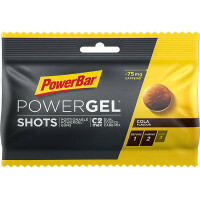 For caffeinated versions: Contains caffeine (125mg/100g). Not recommended for children or pregnant woman.